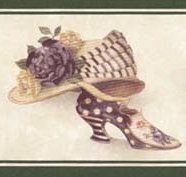 In part one of this tutorial, you learned the basic constructions for a flat crowned, wide brimmed hat. Now comes the fun part. Your decorations and trimmings can be elaborate or simple, colorful or monochromatic, modern or Victorian. You can do a very tailored look using bunka and minimal trims, or a fussy Victorian look with flowers, feathers, lace, ribbons or just about anything else your imagination can come up with! 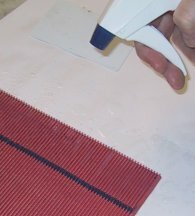 Determine the length of trim you want to make and multiply by 3. 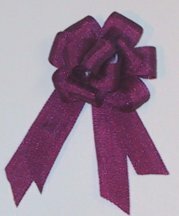 Use your cards to pleat the ribbon, keeping it in a straight line as you pleat. Use clear water in a spray bottle. Lightly mist, and allow to dry completely. If you are impatient, grab the hair dryer. 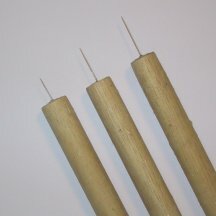 My bowmaking tool is simply a needle placed into a wooden handle. The length of the needle determines the size of the bow. The loops of the bow will be 1/2 as long as the length of the ribbon, and I have made these tools in a variety of sizes so that I can make my bows any size I need. 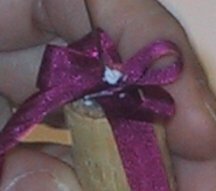 Put 7mm piece of silk ribbon over the needle, leaving a tail if desired. 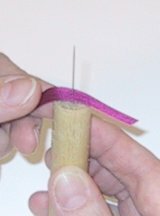 Put a tiny drop of glue on the ribbon next to the needle. 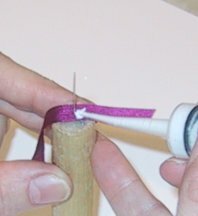 Hold the ribbon down on the tool, and pull the long end of the ribbon up the full length of the needle tool, then insert the needle into the ribbon and push down into the glue, forming a loop. Turn your tool slightly, and repeat, making another loop. Continue in this manner till your bow is full and fluffy. On the last loop, measure the ribbon against the needle, and cut ribbon just beyond this. 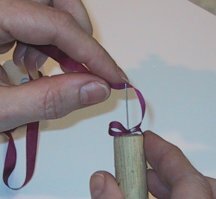 Turn under the end of the ribbon before pushing the needle thru to hide the end of the ribbon inside this last loop. Add ribbon tails to your bow if desired. Be sure to cut the ends of the tail at an angle, or fishtail them so that they won't unravel. Pleat very wide silk ribbon and cover the entire underside of your brim. 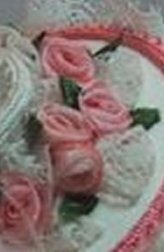 Fill in areas between silk ribbon roses with lots of ribbon loops. 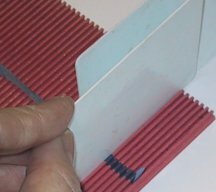 Just apply glue to the area, and use your needle tool to make loops and push into glue. Remember to turn the ribbon to different angles as you work, so that your loops won't all be facing the same direction. Stop occasionally and add a rose or two, and a leaf, and keep looping. This is easy, and oh so elegant. 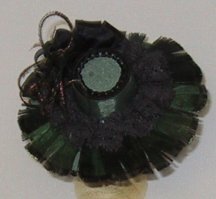 Tulle, netting, bridal illusion.... no matter what you call it, it is a favorite fabric for trimming a hat. Look for the finest tulle you can find, usually in the bridal section of your fabric store. Make sure that it is soft and pliable. And since it usually comes 108" wide, an eighth of a yard will last you a long, long time! Make fluffy tulle bows, using a length of tulle 1" x 12". 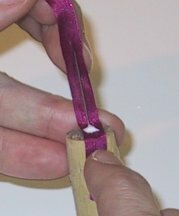 Fold long raw edges to inside, form loops and tack center of bow with needle and thread. Spread netting in loops out till full and fluffy. 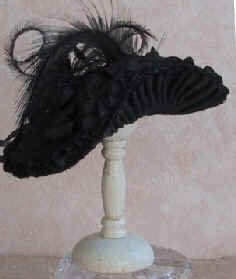 You can also gather up tulle and wrap it around the crown of your hat for a fluffy hatband. 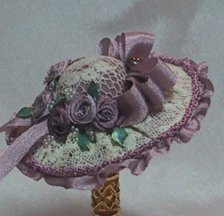 Lace can be used as a lovely gathered trim around the outside of a hat, by substituting it for the ribbon ruffle glued between the brim and brim lining as shown in Lesson One. You can cover the entire brim of your hat with lace. Choose a fine cotton lace, with a pattern in a suitable scale. It should be at least the width of your brim, but may also be a bit wider to extend beyond the brim. Measure around the crown of your hat, and multiply by 2. Cut your lace this length. Gather the straight edge of the lace. 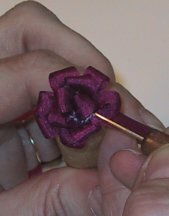 Run a bead of glue around the base of the crown, and position the lace, adjusting the gathers evenly around the brim, and folding under the end before gluing the ends together. 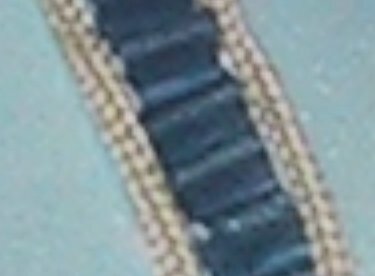 You can leave the finished edge of lace loose, or gather and glue to edge of brim and finish with other trims as in photo. 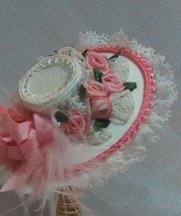 You can also make tiny puffs of lace using the same technique as shown for making netting puffs, and insert these among your ribbon roses. 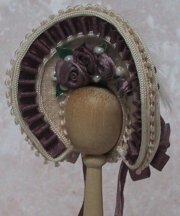 Use bunka or tiny braid to accent the edges of your brim, or to outline the top of a crown. Use bunka to cover the area between the brim and brim lining. and taking an interest in my class. 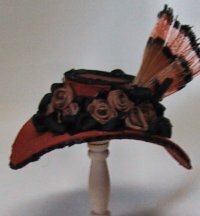 to help you learn the basics of hat making. to help you with your hat making skills.